Earthquakes are a very real threat in California. Emergency shut-off valves are key to making sure you and your home are safe in the event of even the smallest earthquakes. Shut-off valves are designed to automatically cut off the natural gas supply so you do not have to shut it off manually to protect your home from potential leaks. 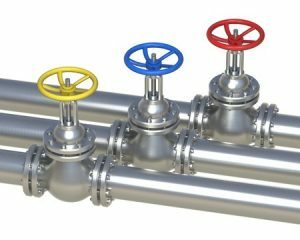 We provide emergency shut-off valve maintenance and installation in West Los Angeles, CA and nearby cities, including Bel Air, CA. Contact us today for more information or to schedule an appointment with one of our honest and professional plumbers. We have years of experience in shut-off valve repair and replacement. When an earthquake occurs, the is a high risk of a gas line breaking, which can result in dangerous levels of carbon monoxide in your home and increases the chances of a fire. The emergency shut-off valve is in place to completely cut off the supply of gas entering your home. If tremors are strong enough to trigger the valve, the flow of natural gas will be cut off in case damage has occurred in the pipeline. Has your emergency shut-off valve been triggered? Call now for one of our team members to come out and inspect the pipeline for cracks and leaks in the gas line. It is important to have the line inspected before having the natural gas service turned back on in your home. The emergency shut-off valve should be inspected at least once a year to make sure that the valve is working properly. We can install new valves if necessary. Installation is a simple procedure that takes less than a day. You always want a professionally trained technician to install and make repairs that deal with changing the gas line. Call today for service in West LA, Beverly Hills, and Pacific Palisades. (310) 454-2010 Our plumbing team has the experience necessary to provide honest estimates and make reliable repairs. Updated on June 15, 2016 at 2:46 pm by Sunset West Plumbing & Rooter.